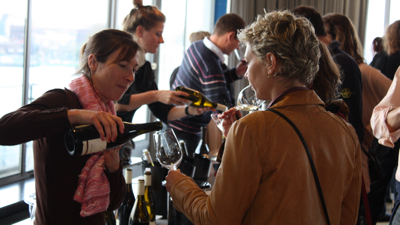 Last weekend was the biggest Bolomey Wijnimport tasting ever. Preparation took a lot of time, but the result was great. 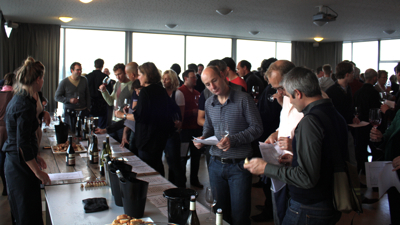 Sunday 31 October some 175 to 200 visitors came to a beautiful penthouse overlooking the IJ to taste 40 wines, and meet the winemakers Coralie Delecheneau (Amboise), Hubert Montigny-Piel (Orléans) and Olivier Collin (Champagne). 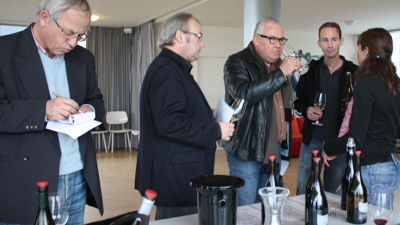 Hubert Montigny-Piel with his colleague Eleonore presenting his popular Orléans rouge (pinot meunier, Wijnalmanak 3 stars), his blanc (unoaked, pure chardonnay) and his Orléans Cléry cabernet franc. 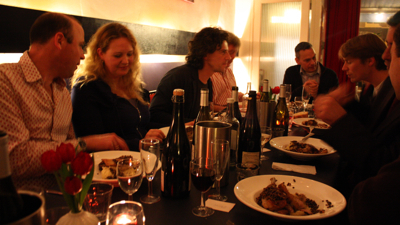 We ended the day with about 25 people in Saskia's Huiskamerrestaurant where we had a great French dinner. I mean: where in Holland do you start with a Salade de Gésiers...? This is me saying something to Helen at the dinner in Saskia's Huiskamerrestaurant. 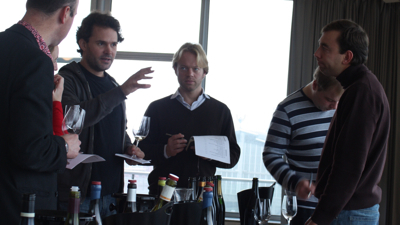 The next day, Monday 1 November, was for the sommeliers and the wine writers. 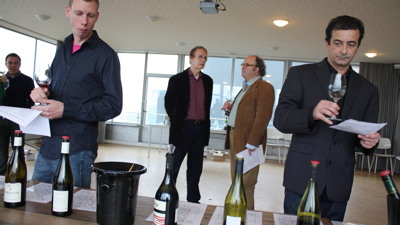 A quiet but not too quiet day and I was glad that a number of Dutch opinion leaders on wine had accepted the invitation to come to the tasting. 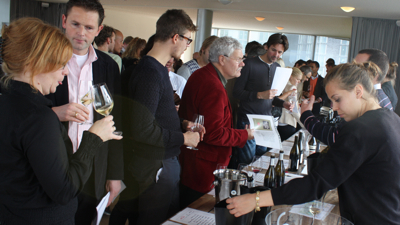 Many thanks to all of you who visited the tastings in Amsterdam! And thanks Jan and Igor for all the help! Will be repeated next year.